I’m in complete denial that it’s already August. Don’t get me wrong, I love Fall time, I love cooking soups and the Fall time is the only time of the year when I bake a lot, however last Winter was brutal where I live so I’m not looking forward to it. Summer felt like it took forever to get here in New England so I’m savoring every single second I can. When the Sunday Supper Family had the idea of “Saving Summer” I couldn’t think of anything to make. I have never made my own preserves or anything like that but then I remembered all of the fresh rosemary that I have growing in my front yard. I’ve been so busy trying to get adjusted to working from home, making exercise a part of my daily routine and redesigning my blog that I haven’t been posting what I’d like to be posting each week. When Stacy from Food Lust People Love and Tara from Noshing with the Nolands said they were hosting this event together I knew it was time to jump back in and start taking part every week with my Sunday Supper family again! Thanks ladies for putting this together because I’ve learnt A LOT when I actually took the time to research preserving your herbs all winter long. This is brilliant, I plan on doing it with Basil soon too! Try it with Olive oil too, you don’t have to use butter but here are some great ways to use these little babies during the winter months. Use to flavor chicken on the stove top. Drop in a cube and saute with chicken. Use in soups or stews. Pastas! Yes Pasta, my daughter is picky and sometimes doesn’t always like spaghetti sauce so I try changing it up by using olive oil and seasonings, or try my new homemade Kale Pesto in a pasta. I plan on dropping one of these cubes on her cooked pasta and melting the flavor right in there! Quick and easy. You don’t have to chop the rosemary too much, another thing I learnt was that an herb like rosemary is easy to freeze as is. You can actually lay the twigs right on a cookie sheet, freeze, bag them, and stick them in your freezer for the winter and use as needed. Crazy huh! I never knew that. So give your rosemary a quick chop. Cut the butter up into squares and add to a sauce pan. Set on low and let the butter melt slowly. Trust me, less heat is better. I may or may not have burnt some! Once the butter is almost melted add in the rosemary stirring to combine until it’s completely melted. Transfer to an easy to pour cup and slowly pour into the ice cube trays. Freeze for at least 4 hours. Pop them out and put them in zip lock bags and use as needed! Be prepared to move fast because they melt rather quickly. Sorry for the two blobs of green. I had a bit of my Kale Pesto leftover that I didn’t want to waste so I decided to freeze it! Lets see what everyone else is doing to save a little bit of summahhhhh this year! 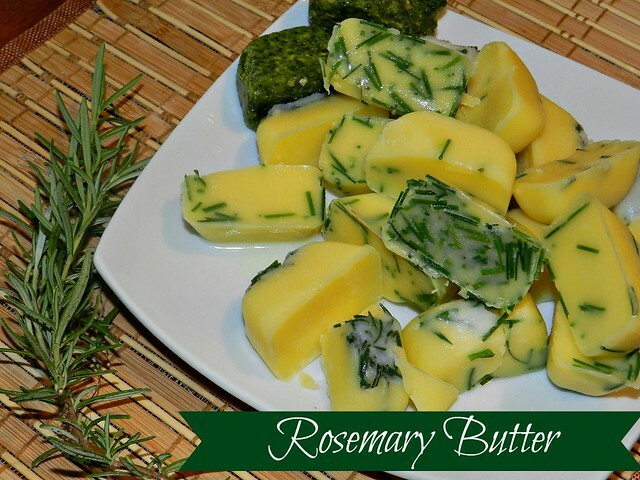 I can just imagine how wonderful these buttery rosemary cubes would be added into some roast potatoes, Tammi! I’ll definitely be trying these soon, as my rosemary is the one herb that seems to do okay in the Dubai heat. Lovely way to save Rosemary. We have a large bush that the children have been picking so it is lush and full of herbs. I think I may send the children out to pick some for this recipe. Warming/melting the butter must bring out even more of the rosemary flavor. How great! My rosemary will not make it though the winter in my garden. 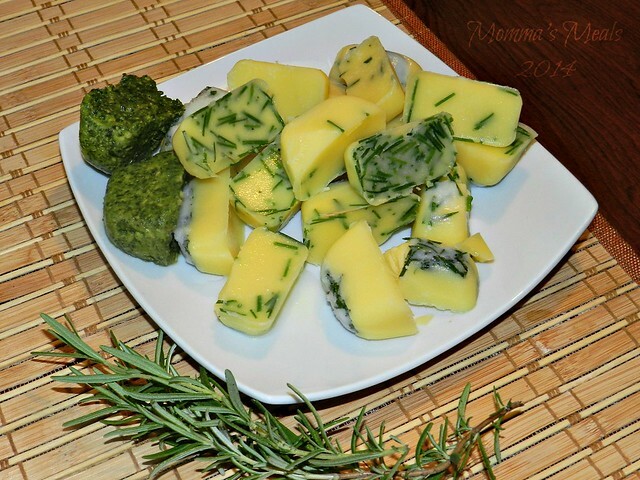 I love this idea of making and freezing rosemary butter! So darned yummy! I have a ton of rosemary growing in my garden. This will be great for enjoying rosemary all year long. Love this idea! Perfect for adding some flavor to any meal! I am right there with you Tammi— say it isn’t so. What a great tip! I have more rosemary than I know what to do with — until now! For some reason rosemary was all that I was successful with this summer! So I’m savoring it Isabel! I do like rosemary butter on things like steak and chicken! Hmmm I have a bread maker that makes butter….hmmmm I think I am making this with the butter feature!!! Mmmm, rosemary butter, now I am drooling!! I love rosemary butter! Hope you enjoy the rest of summer – I’ve been counting down the days to cooler weather, but then again I live in perpetual summer and instead of brutal winters we get scorching heat. love the idea of putting compound butter in ice cube trays! I actually interviewed a chef a few weeks ago and one of his number 1 suggestions to save summer herbs was to put them in compound butters. You are on it! This is my first time trying it! I can’t wait to enjoy it this winter! I love, love, love rosemary! I could use this rosemary butter on so many things! I make compound butters all the time, including with rosemary, but have never done it like this! What a great idea to melt the butter and the freeze in little cubes. GREAT idea. This sounds fabulous! What a delightful accompaniment to any comforting meal! I am learning so much from this week’s Sunday Supper event. Your rosemary butter looks great and I love your idea of how to use it. 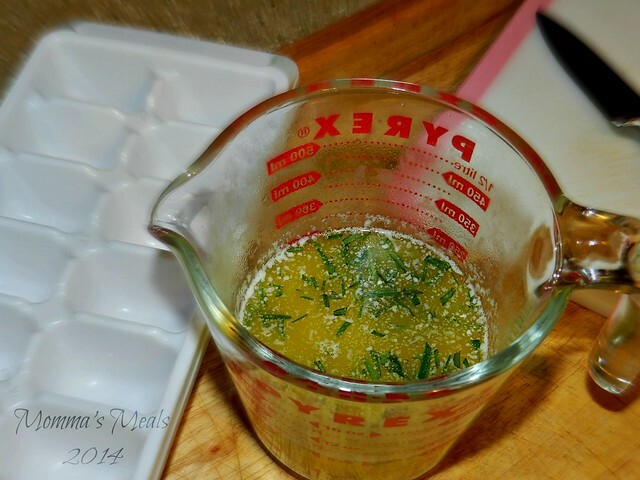 I love to make compound butters … but I’ve never thought to do it in an ice cube tray! It makes such perfect little portions … genius! Thanks for sharing! Love this idea! I could see some chicken sautéed in that butter and maybe served over noodles, yum! I will be making some of these soon. I can picture this on top of some steak or potatoes, mmm delicious! A very handy idea for flavored butter! This would be fantastic on top of some baked potatoes! Oh yummmm rosemary butter on fresh baked bread!! !